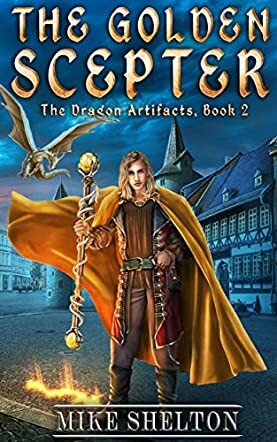 The Golden Scepter (The Dragon Artifacts Book 2) by Mike Shelton is a young adult general fantasy book that would appeal most to a mixed audience of teenagers and young adults who enjoyed the first book in the series, as well as those who love magic, dragons, and adventure! This book takes place after The Golden Dragon with the Dragon King and dragon riders having had their dragons taken by an evil queen who has made it her mission to conquer all. Yet hope is not lost as High Wizard Roland Tyre is ready to step up and save the land by uniting the nations under his banner, if he can stay strong and not allow the scepter to drive him into the depths of madness. Will one of the heroes manage to overcome the evil queen or will she be allowed to conquer the nations? Move over Harry Potter and Eragon and make room for The Golden Scepter (The Dragon Artifacts Book 2) by Mike Shelton! After having greatly enjoyed The Golden Dragon, I was convinced that book two could not possible be as good as sequels are almost never as good as the first in the series, yet I was quite glad to be proven wrong. The author pulled me as deeply into book two as he did with book one and, if anything, I found myself liking this book more as I got to see more of High Wizard Roland Tyre. I personally found him to be a more interesting character in this book as I felt that I learned more about his strength of character as he strove to unite the lands while also being on the edge of either madness or greatness. I was left in suspense wondering which way he would end up leaning and I was not left disappointed. I also really liked the fact that there were some strong female characters in this book and it was not all about strong male characters. When I finished The Golden Scepter, it left me feeling excited for the third book in this series and hoping that it will be available soon!